Pollination is vital to high–quality and high-quantity crop production. One of every three forkfuls of food we eat comes from crops pollinated by insects. 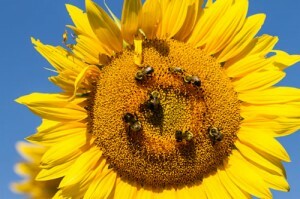 The demand for pollination services is rising at the same time that pollinator abundance and diversity are declining. While native bees may not be able to replace the honey bee (the single most important pollinator species), they can contribute significantly to crop pollination of apples, blackberries, blueberries, cherries, cranberries, pears, plums, squash, tomatoes and watermelons. The pollination services native bees provide are contingent on both landscape and farm practices that influence bee habitat. Integrating practices that support native bee populations makes sense economically for the farms of New Jersey. Avoid killing off the native pollinators on your farm by following the same cultural practices used for honey bees such as: minimize insecticide applications during bloom; minimize mowing, haying, burning during periods bees are most active. Know preferred forages. 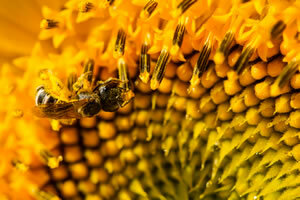 Pollinators feed on nectar and pollen, which come exclusively from flowers. See the sidebar for a variety of flowering plants -many of them weeds- that can attract and support pollinators. Preserve areas of native pollinator habitat when possible. There are three common bee nesting strategies: ground nesting bees, wood nesting bees, and bumble bees. Ground nesting bees require direct access to soil in well-drained, sunny areas. Look for small, very circular holes in the ground surrounded by piles of displaced dirt. Leave some areas of sunny, well-drained, south-facing sloped ground undisturbed. Wood nesting bees are found in pithy twig or vine centers, rotting wood, and existing cavities in wood. Only carpenter bees chew their own nest cells into soft wood substrates; others require existing holes. Leave dead wood in some areas near flowering plants. 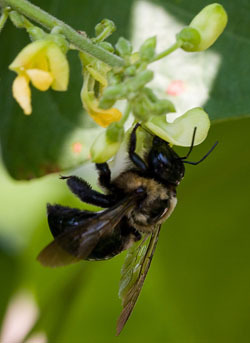 Cut back plants with pithy stems annually to allow bee access to pithy centers. Bumble bees are more generalist in their nesting habits and can be found under leaves, in old rodent dens and other preexisting cavities, above or below ground. If possible, leave nesting sites unmowed, untilled.